How to condense 2 1/2 hours of coloring into a video that’s short enough for people to watch. And … glitter. Got spiro-skills? Use them to make unique, hand-drawn greeting cards with your Spirograph or Wild Gears. Two videos of making the same amazing full-page Wild Gears design using different colour combinations. Which do you prefer? Thanks to a reader who sent me a link to this video by Delcopond from Spain who calls Wild Gears “the king of spirograph” – which I think is a great tagline. A video featuring spirograph-like designs drawn with Wild Gears, using its unique ability to draw patterns with parallel lines. Get $5 off your WildGears purchase over $25 by using the code WildDeal at checkout! 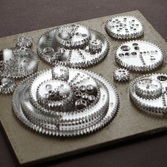 Click here to buy Wild Gears. Start with the Full Page Gear Set or the Compact Gear Set and branch out from there. Read more about WildGears at www.WildGears.com. These two brands of fine-tipped felt pens that I recommend for Spirograph give you more colors than you ever dreamed of, and work great with the smaller Wild Gears. With the larger wheels, they work, but I prefer a more robustly built tip. See the Pens page for reviews of various brands of pen for both Wild Gears and Spirograph.